Designed for firing solid fuel - firewood, Class B wood briquettes or coal. With an option for fitting pellet, oil or gas-fired burner. Tested and approved according to EN 303-5. - Simple installation and handling. - The water mantle embraces the combustion chamber in full to utilize the emitted heat most efficiently. - Combustion chamber with large heat exchanging surface and low chamber resistance. 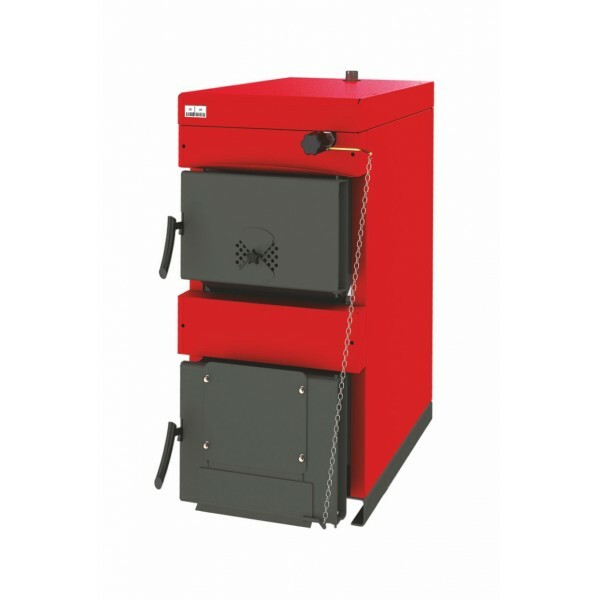 - Large firebox door ensures easy loading even with bigger logs (length of logs up to 50 cm). -Ribbed chamber surface and three-pass flue gas flow for improved heat exchange. - Exchangeable metallic ash grate protects the pipe grid from the flame. - TBurner flange on lower door for fitting pellet, oil or gas burners (optional). - Safety heat evacuator a tap-water-filled line passes through the upmost part of the boiler body. In case of overheating it is triggered open by a thermostatic valve (not included) to evacuate the heat of the boiler.